Hosting, hospitality and nourishing are just a few words that our visitors and residents tend to use when describing what makes the culture of the FoAM network unique. Among the most obvious expressions of FoAM’s hosting culture are our residencies, but over the years this culture has spilled across most if not all of our activities, especially at FoAM in Brussels. It was therefore interesting to host a host as resident last year. Luea Ritter recently concluded her macrotransiency with a meditative research gathering on Midsummer Night. 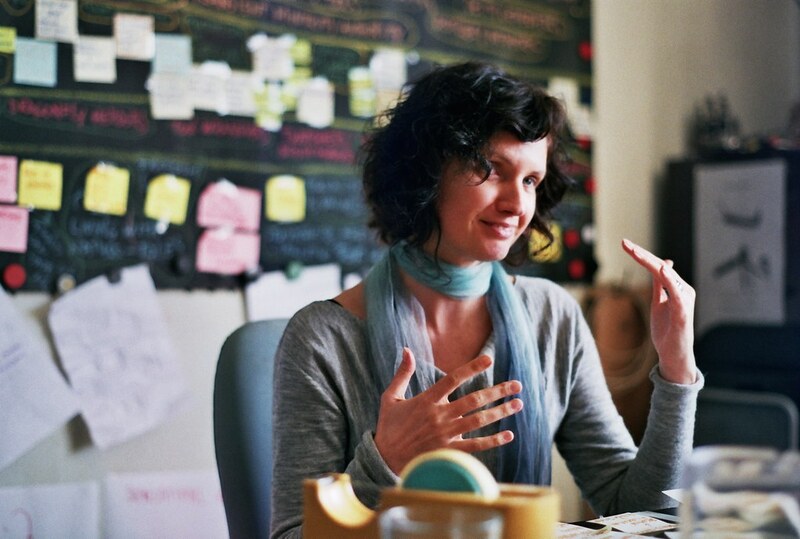 Sharing her process and findings with an audience for the first time, Luea guided us through a series of meditative experiences that flowed together as phases of one long ritual – the “hero's journey”, as Luea described her year-long process of transition. Although this concludes her official transiency, Luea has since become a member of FoAM and will continue gracing our Brussels studio with her presence. In the coming months she is planning to lay down the foundation for a travel guide to transitions, based on her research and experiences during the transiency. 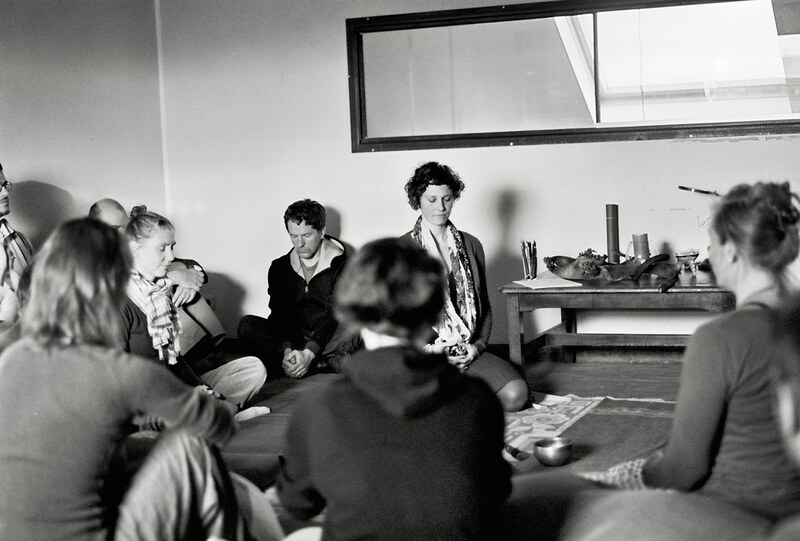 If you read Dutch, Lies Declerck wrote a beautiful reflection on Luea's research gathering and how some of the ideas and processes resonated with her and Stevie Wishart, leading to the seed of an initiative to create a contemporary Open Convent, where silence, song and ritual can take centre stage. Even though hosting comes naturally to most of us at FoAM, we realised that it’s not something widely shared (or even understood) in the worlds we spend most of our professional lives in. However, when we host a workshop, a gathering or a simple apéro, our efforts are very much appreciated. 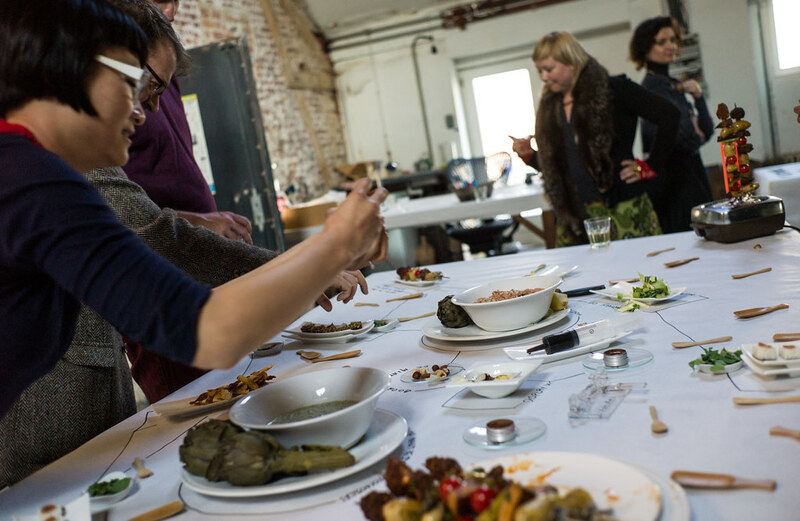 Last year we were approached by several people from the Flemish cultural sector who were keen to add hosting to their already impressive repertoire of people skills. In response, we initiated “Hosting Craft” at FoAM in Brussels, where we share our knowledge about how to host conversations and co-creation in a group. Hosting Craft sessions are packed with practical skills and theoretical reflections we accumulated over the years. While the sessions tackle “hosting” or “facilitation” in the broadest sense, the topics they cover are applicable to any number of more specific circumstances, such as teaching, tutoring, dinner parties, holding a seminar, probably even talkback shows… Recent sessions have looked at listening and summarising (in April), and graphic harvesting (in June). The next installment (in September) will feature designing “flows” of conversations, drawing on such frameworks and techniques as Theory U and our experimental scenario methods. So far the sessions have been led by me, but from September onwards the format will be less oriented towards training and become more of a support group for hosts of all denominations.We will be practicing different techniques, helping each other design processes and even co-creating hosting projects together. We are in conversation with other hosting initiatives, such as the Art of Hosting and FoAM's old friends of Natural Innovation, to see where our activities and approaches might be complementary. The collaboration in the Hosting Craft group is so promising that we're thinking of offering our services as a group in future. In fact, a couple of months ago several participants embarked on their first facilitation spree with the PULSE Cultuurnetwerk Transitie. 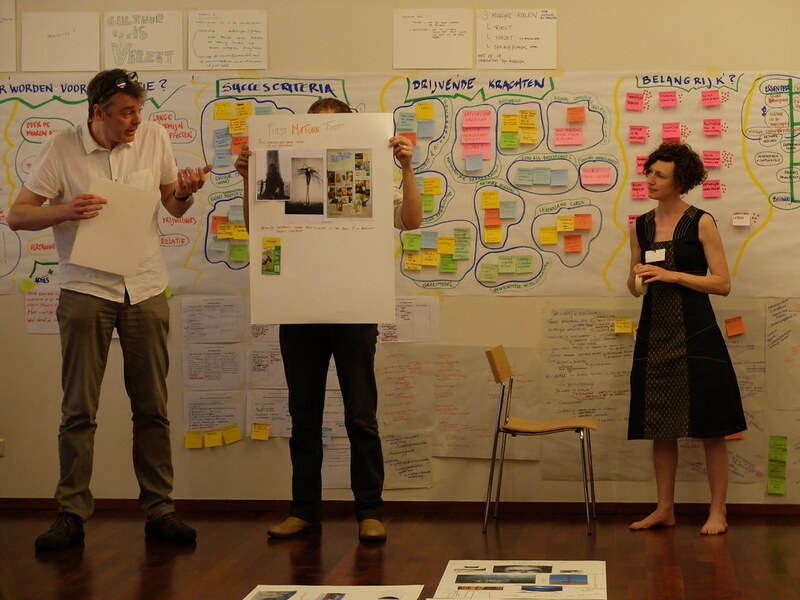 I was happy to have the trainee facilitators – Kathleen Melis, Rasa Alksnyte, Eva de Groote and Lies Declerck – join me in hosting three visioning days for the members of PULSE, an initiative that seeks transition towards a more sustainable cultural sector. Since May, we have guided the group in developing eight scenarios and pre-enactments to find inspiring answers to the question, “What if we, from the cultural sector, become an engine for transition?” We will come back in September to ground imagination in the concrete practices of participants and work together to grow new connections between them. In October we will be present at the PULSE Trefdag in Mechelen, Belgium. After that we hope that the participants will take up some of the ideas and findings both in their individual contexts and with PULSE, translating their worthy mission into reality.